Democrat Andrew Gillum's surprise victory in the Florida gubernatorial primary sets up a race between a young, black progressive and Rep. Ron DeSantis, a Republican who has staked his political career on his ties to President Trump. The big story from Tuesday's primaries comes from Florida, where progressive, Bernie Sanders-endorsed Democrat Andrew Gillum won his party's nomination for governor. He will take on Rep. Ron DeSantis, who prides himself on his closeness with President Trump, who enthusiastically backed him. In Arizona, meanwhile, a nasty fight is taking shape between a Republican former fighter pilot, Rep. Martha McSally, and Kyrsten Sinema, a Democrat who tried to appeal to independents while Republicans duked it out over who is most like Trump. 1. 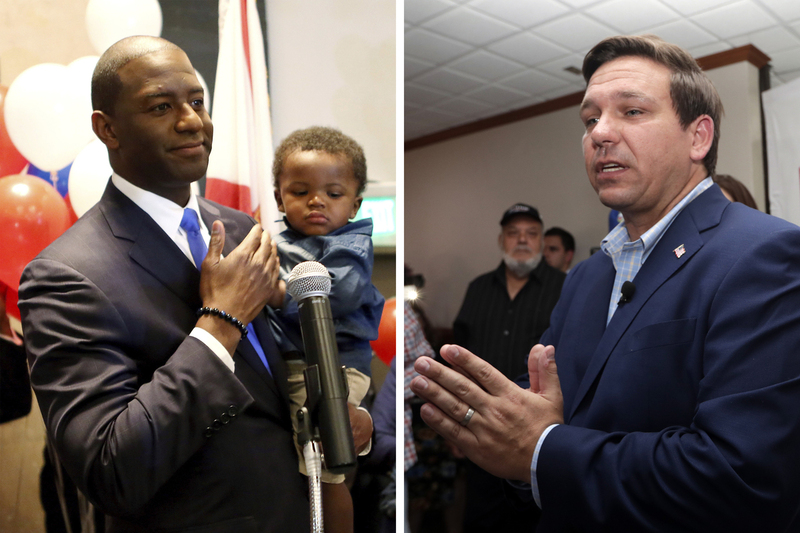 Florida, Florida Florida — the governor's race just became the hottest race to watch this fall. Call it the Bernie Sanders-Donald Trump race that never happened. Gillum's surprise victory for the Democratic nomination for governor of Florida sets up a race between a young, black progressive with an aspirational working-class message and DeSantis, a Republican who has staked his political career on his ties to President Trump. The bases of both parties want at each other. Now, they'll get their chance. And it's all taking place in the swingiest of swing states. Wow. So, where does America stand, after almost two years of a Trump presidency? Florida, as in so many other elections, may very well tell us. What makes Gillum's win even more impressive is that he was far outspent. In a primary contest that saw a whopping $112 million spent overall on TV ads ($73 million of that in the Democratic primary), the most of any race in the country, Gillum's campaign and groups supporting him were outspent by a factor of five by the Democratic favorite — and even more by other millionaires who ran. Gillum and allies spent just $2.5 million, according to NBC News. Former Rep. Gwen Graham (daughter of Bob Graham, the former Florida governor and senator) and groups supporting her spent $12.5 million. It's a lesson that a clear message matters, as does political energy. Gillum fired up the progressive base and, despite not leading in a single poll, he peaked at the right time. He had momentum, which was evident by an event he held with Sanders this month in Tampa that drew about 1,000 people and raised eyebrows. But in a state with as many expensive media markets as Florida, no one can win statewide without breaking the bank. And Gillum now has the backing of two billionaires in George Soros and Tom Steyer — and expect the money to flow inside and outside the state on both sides as the general election kicks into high gear. The amount of money that's going to be spent in this state by November will probably be staggering. 3. Republican turnout is a warning sign for Democrats. For all the excitement around Gillum with the progressive base — and there is plenty of reason for them to be excited; just take a look at his victory speech Tuesday night — his win carries a warning sign, too. It should be pointed out that Republicans turned out in greater numbers for their gubernatorial primary. About 1.6 million Republicans turned out in the GOP primary, while 1.5 million Democrats did. What's more, DeSantis got about 914,000 votes, while Gillum got almost 400,000 fewer. But Gillum still has room to grow: The turnout rate in Miami-Dade, a crucial Democratic area, was the highest in at least a decade — higher than the 2016 primary, and Gillum was not very well known in that part of the state before last night and faced a more crowded primary than DeSantis. But he still has some work ahead for that to happen. Robust Republican turnout wasn't isolated to Florida, either. The GOP also saw higher turnout in the Arizona governor's race and the hotly watched Senate contest. That's despite Democrat Sinema's lead — so far — in general-election polls over Republican McSally. Of course, there was much more activity in the GOP primary, so perhaps it's understandable, but it's something to watch in Arizona, a right-leaning state. 4. Get ready for an ugly fall. Arizona underscored how sharply negative the fall campaigns are about to get. With Sinema leading in the polls, having the luxury to tack to the center while McSally duked it out with two candidates who pulled her to the right, McSally, a former fighter pilot, came out firing. "I am as impressed as anyone that my opponent owns over 100 pairs of shoes," McSally said in her victory speech Tuesday night. "I, on the other hand, flew over 100 combat missions for our country." She also controversially said Tuesday night that the race was a contest "between a patriot and a protester." It's a tactic she used against Sinema during the primary, trying to out-tough her the whole time. She even ran an ad showing Sinema protesting in a pink tutu. McSally is going so negative because negativity is what moves the numbers. With so much at stake this fall in races around the country, you can bet it's about to get a lot nastier. 5. Democratic women keep piling up the wins. Regardless of who wins the Arizona Senate race, the state will send its first woman to the Senate in history. It's a storyline we've been watching all primary season. A record number of women have run for office, and a record number of Democratic women have won nominations for governors' and House seats. Last week, the number of female nominees overall for the U.S. House hit 200 for the first time ever — 155 of those, though, were Democratic women. And Tuesday night, Democratic women piled up even more — 19 Democratic women won their party's nomination for the U.S. House. That is a majority — 53 percent — of all the House seats with primaries Tuesday night. And Florida, in particular, will have a wide slate of Democratic women candidates on the ballot this fall, with 16 of 27 congressional races featuring a woman as the Democratic nominee. The story is not the same on the Republican side. In just four of 36 races Tuesday night, a female Republican candidate emerged as the preferred choice of GOP primary voters. In Florida, it's just two of 27. That is quite the contrast with Democrats. Factoring in Tuesday night's results, overall, 174 Democratic women will be their party's nominee this fall (so far), a record. That far surpasses the prior record of 120 in 2016. On the Republican side, however, just 49 women will be their party's standard-bearer out of 435 seats.